Please help! Young people today face more challenges than ever before. Your gift will assist in providing the care, treatment, education and resources CJR boys and girls need to achieve brighter futures. The Connecticut Junior Republic appreciates your support. If you are making a payment by credit card, please consider using the "Other" gift option and adding 3% to your contribution to help cover the fees associated with accepting gifts online. For larger donations, please consider making your gift by check. I/we wish to appear as 'Anonymous' on any printed or public recognition lists. If paying by check, please make payable to: CJR Fund, Inc. 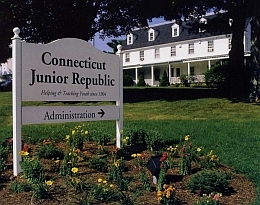 The Connecticut Junior Republic is a (501)(C)(3) charitable organization. Gifts are tax deductible as permitted by law. Do you have a special reason for making this gift? Is this gift intended for a specific CJR program or location? I would like to know more about CJR. Please contact me. I am considering including the Junior Republic in my will and would like more information. I have included the Junior Republic in my will. I would like CJR to remember my birthday.